Trigonometery For Little Kids with base ten blocks. In this pic we see our little man looking from 60° so we can figure out the relationships and put them on the table. Quick lesson on Trig. This was maybe 15 minutes of an hour lesson where we practiced addends, algebra, multiplication, subtraction, division and more. If it was a little kid we would have drawn a generic triangle and talked about SOH CAH TOA. And that would have been it. See: How To Teach Trig To Eight Year Olds. 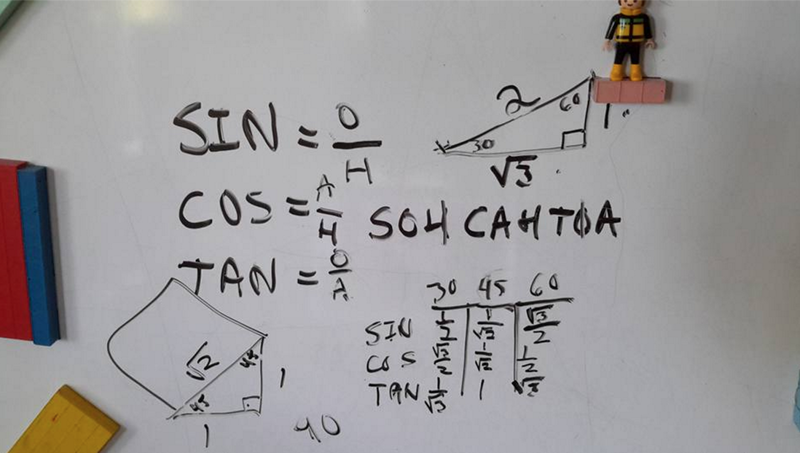 We talked about Pythagorean theorem (one or more lessons in and of itself), the fact that the angles add up o 180 another lesson in and of itself and a great way to practice some subtraction...subtract from 100, 100.00 and then subtract from 90 and 90.00. We talked about that too...if all I did was memorize SIN30° = .5 and didn't even know that meant the relationship between the opposite side and the hypotenuse was one to two, trig is going to be hard and NO FUN...and no fun. And if I play on the unit circle without even having been exposed to basic concepts the cognitive load is too high, not to mention they probably aren't even trying to teach to my learning style, and I get an "F" and then I have self esteem problems...and $35 bucks a month is too much. OK. There are a leaste SIX separate lessons here...all of which can be EASILY understood by a six year old if you keep the numbers small while explaining the concepts. Get a password. For $35 bucks a month for 10 months you can have these lessons and more FOR LIFE and AVOID the tears that typically come with math when they are teens...most people wait until their kids are 13 or 14 or even 15 and 16 and confused instead of avoiding the problem in the first place.